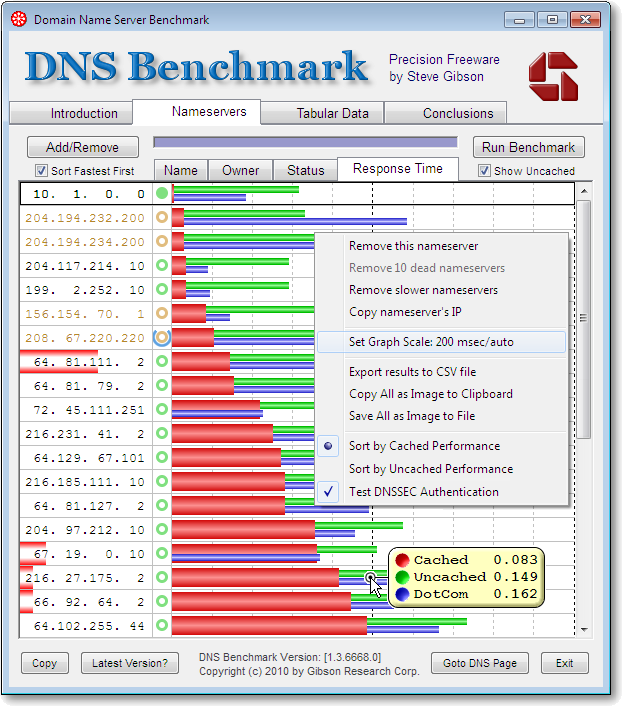 A unique, comprehensive, accurate &amp; free Windows (and Linux/Wine) utility to determine the exact performance of local and remote DNS nameservers . . .
2t	Click the “Run Benchmark” button (it may take a moment to become enabled). 3t	Click and read the “Conclusions” tab after the benchmark completes. 820 1,772 Gibson Research Corporation <img src="http://www.oldergeeks.com/downloads/gallery/thumbs/DNSBench1_th.png"border="0"> Apr 13, 2018 - 10:58 1.3.6668 165.6KB EXE , out of 14 Votes.